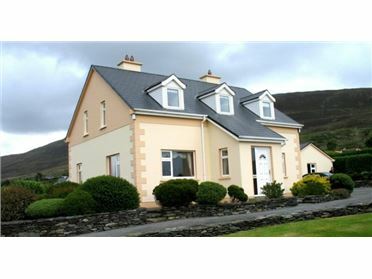 Killary View is a luxury 3 bedroom cottage located in the scenic village of Leenane in the heart of Connemara. This well appointed site is truly spectacular, offering unrivaled views of the surrounding mountains and rugged coastline. The awe inspiring location can only be described as 'Heaven on Earth'. Leenane is perfectly positioned in the Connemara Loop at the mouth of Killary Fjord, and the majesty of the mountains and the mystery of the sea combine to make the setting unforgettable.Local amenities including shops, pubs and restaurants are located within a One minute stroll. There are several unspoiled sandy beaches within a ten miles radius. Killary Adventure Centre, a leading outdoor adventure centre is 10 minutes away and Delphi spa is just a half hours drive. This is an excellent spot for keen anglers as the cottage is five minutes from the Fisheries Boards, Ashleigh Lodge, where rods, gillies and boats can be arranged .Scuba Diving is also available with fifteen minutes drive.Clifden is just a short drive away through some of the most spectacular scenery Ireland has to offer . 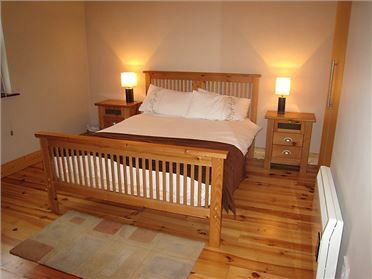 Westport with its thriving tourist business, lively pubs and the very best of hospitality is also within half hour.Accommodation is of highest standard and includes 2 double en suite bedrooms.